This weeks special newsletter has been written by Chris Vermeulen of TheGoldAndOilGuy, a site which is geared towards trading gold, silver and crude oil Exchange Traded Funds (ETF's). Chris's service is designed for long term investors and active traders who insist on a conservative approach to investing. Utilising several ETF's such as GLD, GDX, SLV, USO, DIG, DUG and many more which allows for accurate signals when used along with an unbiased technical trading approach. Over the years Chris has found that his strategy delivers extremely impressive yields. This weeks analysis covers ETF trading of Dow Jones Index Shorts (DIA), Gold (GDL), Silver (SLV) and Crude Oil (USO). I hope you find his analysis illuminating and if interested visit his site TheGoldAndOilGuy for further strategies on trading ETF's. If you look at the monthly chart of the Dow Jones Industrial Average you can see that both of the previous bear markets back in 1998 and 2003 both bounced off the 6500 level before starting a new bull market. The Dow is currently at the 8000 level and looking very weak. I don't forecast prices but technically the market could break down and reach the 6500 within 1-2 months with our current level of volatility in the market and continued negative news with the tarp bailouts not working. The daily chart of the Dow does not look so hot. 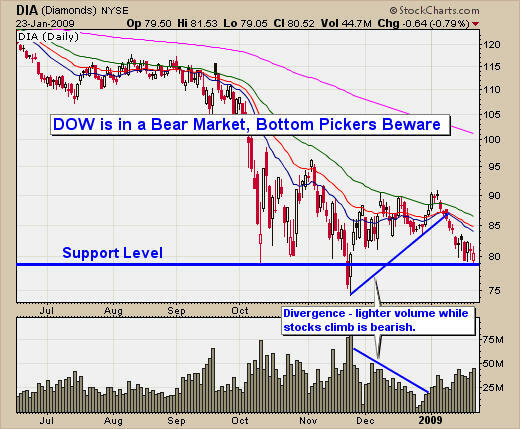 Last month the Dow slowly climbed on lighter volume which is a bearish movement. Once the price was at the top of its short term trading range from the past month, sellers jumped in forcing stocks lower on increased volume. These are the characteristics of a bear market and long positions should be protected with stops or hedging which is what I mentioned a couple weeks ago in my report. Currently the daily chart is has sold down to support on increased volume and flirting with another major breakdown. What has me worried is that everyone things the market has bottomed, and if that's the case then all the buyers are long and a breakdown will trigger everyone's stops and margin calls will flood the market sending prices tumbling to new multi year lows. Spot gold prices soared on Friday as investors move their money into gold which is generally a safe haven during tough economic times and a US dollar which could drop sharply within the next 2-3 months. 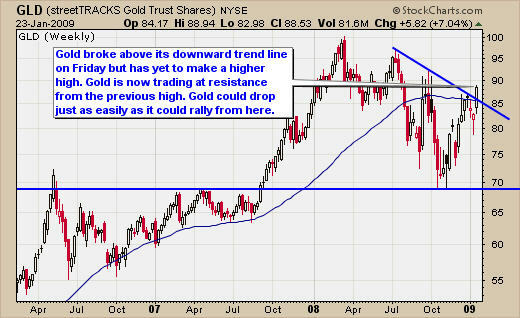 The weekly gold chart shows a very clear breakout to the up side of its current downward trend line. This chart looks to be strong its is important to note that it still has not made a new higher high, and is now trading at resistance of the previous short term top put in place last November. Gold could just as easily drop from here as it could rally. 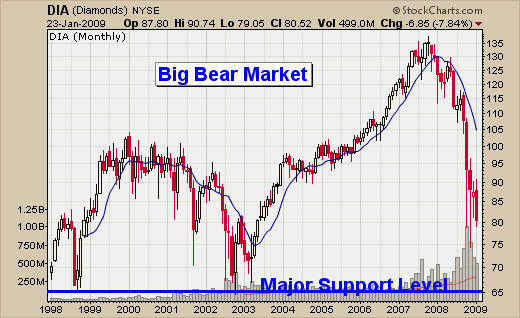 We did not have a buy signal last week because momentum was very strong to the down side on the daily chart. I only like to play reversals when we have momentum in our favor. That being said, momentum is now in our favor and we will be looking for a pullback for possible entry points now. On the daily chart the MACD was headed lower with a breakdown which is the main reason I was not willing to put our hard earned money to work. I do miss some nice moves if our funds but I make sure the odds will be in our favor before pulling the trigger. 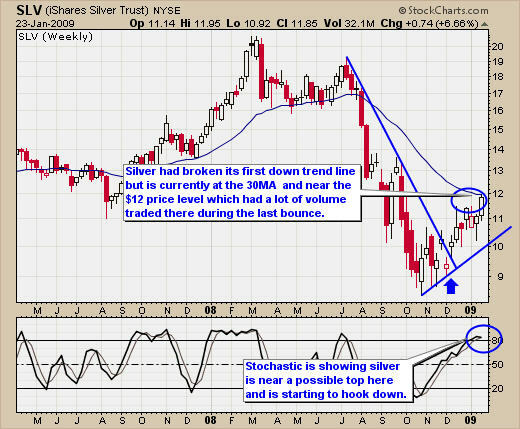 Silver had the same things happening to it as gold did last week. 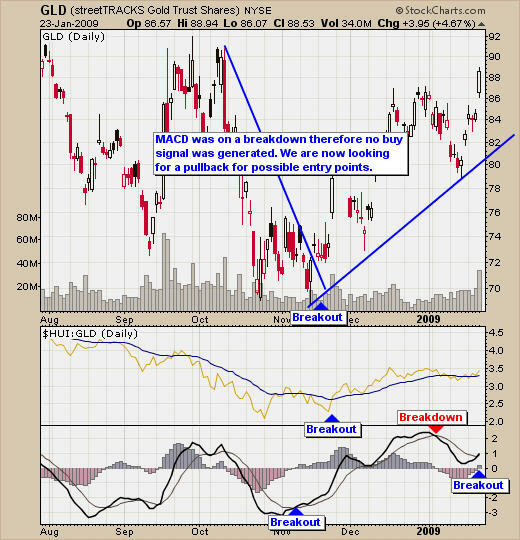 MACD (momentum) was down and its risk was over 3%. We are now looking for entry points during a pullback. Crude Oil is something that I think has huge potential because of its prolonged down trend without any real bounces and because there is so much interest from traders and investors who want to catch this bounce. The weekly chart is starting to look amazing and the daily chart looks ready to pop as well. 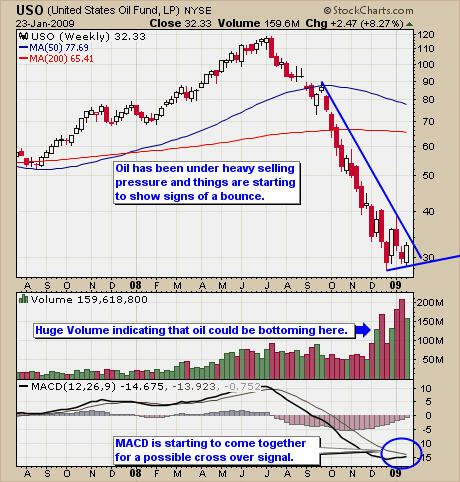 The weekly oil trading chart shows a long 7 month sell off without any small bounces on the way down and volume has increased as the price slides lower indicating that there is more and more interest from traders and investors. Prices have now put in a small bounce and will be testing our downward trend line if price continue to rally this week. Also the MACD (momentum) is about to cross to the upside which is very bullish. 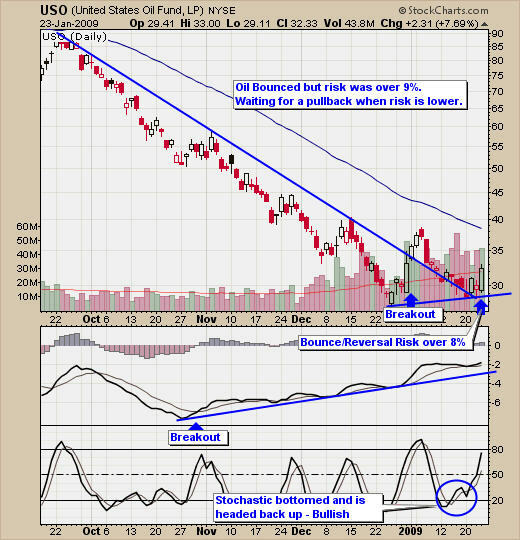 If oil prices breakout above our down trend line and the MACD crosses over to the upside then we will have a buy signal in oil. Crude Oil's daily chart is very bullish looking as well. The price has broken is downward trend line and has pulled back to a support level over the past 2 weeks. Fridays big bounce gave us a buy signal for USO because everything for my oil trading strategy was in favor (MACD cross, Stochastic, Trend line Break). The only issue was that risk was over 3%, it is currently at 9% and I will wait for a better entry point on a small correction. Crude oil as you can see looks to be a picture perfect setup as momentum in the price is slowly shifting direction. While many traders went long on Fridays buy signal I am waiting for risk to decrease before I put my money to work. I don't mind buying things at a higher price if the overall risk is lower and the reversal looks strong. I have put together a package for yearly subscribers which is if you join for a year ($299) I will send you $300 in gas vouchers FREE which are valid at the major gas stations in USA & Canada. Valid At: Chevron, Texaco, Sunoco, CITGO, Mobil, Esso, Shell, BP, And More... as Holiday Special! If you interested please act fast as I only have a few of these gas vouchers before they are gone for good.